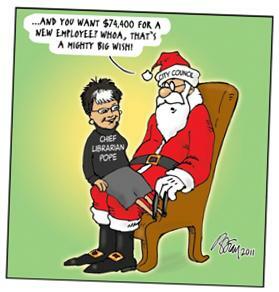 December is municipal budget season in Guelph. City departments, the police, health units, and yes, the public library are all vying for the taxpayer’s hard-earned dollars. This year, GPL went in with a modest budget proposal of a 1.6% increase on last year’s budget and the request for one additional staff member, a Development Officer at a cost of $74,200 to increase our revenue line. The request was received politely by Council, but much to my surprise, the above cartoon appeared in the local newspaper the following week. I was shocked. I have been quoted, misquoted, photographed, and lampooned, but never before have I been cartooned. The end result of this year’s budget process was that GPL received a 2.3% budget increase for 2012 including funding to hire a Development Officer. We are thrilled, humbled, and grateful all at the same time. But you know I am going to ask, what did I learn? ►All publicity is good publicity, as scary as that may seem to us in library land. ►Service reviews add significantly to the libraries’ credibility as responsible and dynamic business units that, with rigorous evaluation, are improving. ►It takes a team to bring home the bacon! From staff, to the board, to city council, many folks have a hand it making a public library successful and relevant. So now the real work begins, as we learn how to build more effective business cases and begin mining an alternate revenue stream for GPL.